The music currently wrecking your speakers was laid to tape in a mind-bending three days and mixed in another three, perhaps explaining the hectic but focused carnival-chaos of its ten songs. That pace was achieved in part because the group recorded as if they were playing onstage – no laying down the breakbeats before the band came in, everything was played live, with the minimum of overdubs. They were also tight as hell because they’d just come off the road. And it probably didn’t hurt that they’d already recorded the album once before, and had toured it for several months, beating those songs into fiendish shape. Yes, the story of ‘More Signal More Noise’ began months before the ADF arkestra set foot in Red Bull. Indeed, the roots of the album can be traced as far back as 2012, and the group’s performance of their live soundtrack to Mathieu Kassovitz’ magnificent, brutal thriller La Haine. ADF had first rescored the movie at the Barbican in 2001; however, this latest screening (at the request of Secret Cinema’s Fabien Rigall) was particularly momentous, taking place on Tottenham’s Broadwater Farm Estate on the eve of the London Mayoral elections in May, less than a year after Broadwater Farm resident Mark Duggan was shot dead by police officers, the event that lit the touchpaper for the London riots of 2011. The performance also witnessed a crucial reunion within the ADF ranks, as founder member Dr Das rejoined the group, six years after retiring from active ADF service. The success of the La Haine event led to further shows – a sell-out gig at London’s Troxy, a thrilling night at Paris’ La Trianon the night before Sarkozy was ejected from office – and fertile jam sessions at Community Music, the organisation from which ADF first sprang, where Savale was teaching a course in music that traced connections between Link Wray’s Rumble and Lethal Bizzle’s Pow. The new version of the album definitely feels like lightning caught in a bottle, the finest elements of the Sherwood sessions rubbing sweaty shoulders with the new recordings to deliver a punky, dubby party that’ll shake the floors and light a Molotov or two along the way. But while ‘More Signal More Noise’ perfectly preserves ADF’s native verve on wax, all that energy would count for nought without songs to back it up. And the new album offers forth some of the finest tuneage of the ‘Foundation’s storied career. Radio Bubblegum is a classic in the making, deliciously tricky rhythms underpinning punk-funk riffage and pop hooks as Ghetto Priest takes a swing at anodyne radiowaves with a sunsplash anthem that would doubtless enjoy heavy rotation on a planet more just than this. “It’s sort-of-Afrobeat, sort-of-noise, with loads of mad flute,” smiles Savale. “It’s about cultural programming, about marketing music based on demographics and people’s spending habits. And that’s something that doesn’t work for us.” Indeed, ADF are more about breaking barriers than operating meekly within demographical boundaries. It’s a truth Savale has understood for a long time, a belief he and his bandmates put into fierce practice on, an album that delivers both signal and noise in quotients that promise to annihilate any audience complacency. 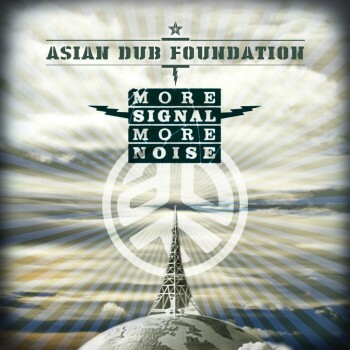 Have Asian Dub Foundation ever sounded this focused, this electric, this alive? It’s an album that’s more than the sum of its considerable parts. Tune into both the signal and the noise, and prepare to have your mind blown, and your dancefloor torn up.